★ FAST: Removes tape in extensions in 10 seconds! 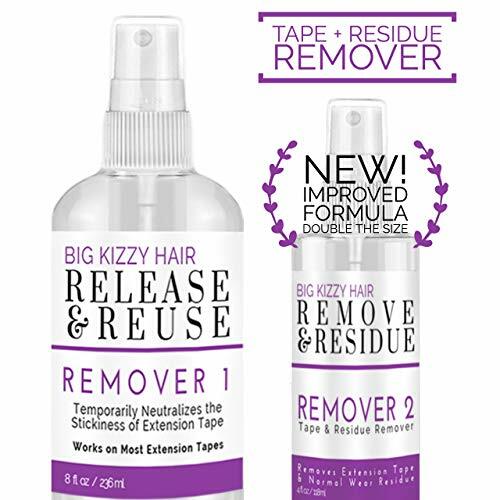 Big Kizzy's Release and Reuse is a "wow that is an awesome product" when you have adhesive to remove from your hair extensions. It works great because it removes the tape in one piece instead of a million little pieces that you have to pick out of your hair or painstakingly remove from the weft. ★ USEFULNESS: If you get extremely nervous about the tape adhesive pulling out your hair you have found the perfect product cause you will have NO hair loss when taking them out with our release and reuse. It makes them quite easy to remove in just seconds. Don't waste your time trying the others. This is the only remover that won't rip any of your hair out. It's fantastic! ★ DESIGN: You will like this better than the citrus sprays. You can concentrate it where you need a lot, soaking the weft & getting it loose. Not damaging & drying like glue remover. The easiest and best product on the market for removing adhesive. If you have tried them all you will like ours the best. ★ EFFECTIVE: 2 removers included: 8oz Release & Reuse and 4oz Remove & Residue. Start all tape removals with Realease & Reuse. 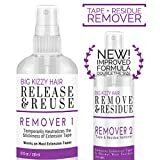 This remover temporarily neutralizes the stickiness of extension tape allowing it to be easily removed & quickly corrects application mistakes without retaping or shampooing tape extensions. Remover 2 - Remove & Residue helps deal with sticky residue that is sometimes left behind after removing tape extensions. ★ 100% MONEY BACK GUARANTEE: When you use our Release & Reuse and don't experience fast and efficient adhesive removal along with absolutely loving it we will refund your money. Our world-class Big Kizzy customer service wants you to be SATISFIED with your purchase. Absolutely no risk. The product comes with our 100% satisfaction guarantee. Get yours TODAY! Hair Extensions Tape Pressing Sealing Tool + 72 Tabs Regular Hold + 72 Tabs Extra Hold 4cm x .8cm Hair Extension Tape. Compatible with Hot Heads, Hairdreams, Babe & Most Other Brands.